The graphical user interface is a standalone user interface. Start the Java GUI on the same machine under test that has the Oracle VTS kernel running. The GUI does not allow remote connection. Review important information and perform any necessary steps before starting the software. 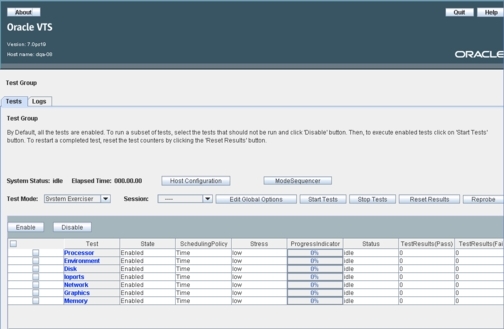 The Oracle Validation Test Suite main window is displayed. See Testing Using the GUI to begin testing.